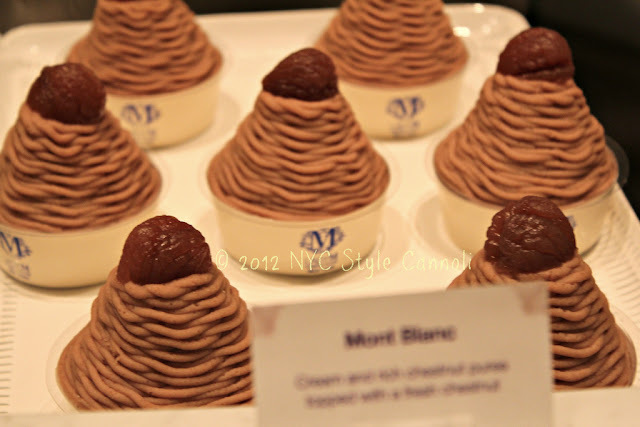 Photo Gallery Thursday " Have you ever had a Mont Blanc?" A personal Mont Blanc perfectly sized for one. Two elements: cream and the richest chestnut puree. The puree is lightly sweetened, rises high above the cup and all the way down, forming a snug cocoon for the cream, whipped voluptuous and thick. To finish, a single fresh chestnut. So if you had one, would you share it or keep it all to yourself?? I've never had one, but the description sounds so delectable. What a sweet treat! I bet it tastes as good as it looks. HaHa Have a great day.